The medical team at the HIFU CLINIC Prostate Cancer Treatment Centre is headed by Marek Filipek, MD, PhD, specialist in urology and general surgery. Dr M. Filipek is the first urologist in Poland who in 2012 was certified as Ablatherm® HIFU operator by the equipment manufacturer (EDAP TMS, France). Dr Filipek, as the only operator in Central and Eastern Europe, can train surgeons and medical teams at other centres in the HIFU method. At the same time as the Head of the Team at the HIFU CLINIC Prostate Cancer Treatment Centre, he cooperates with the Medicover Hospital in Wilanów, Warsaw. Dr Filipek is a graduate of the Faculty of Medicine at the Medical University in Krakow, where in 1977 he graduated from the Faculty of Medicine, in 1980 completed the basic specialist training in general surgery, and in 1986 completed the second-level specialist training in urology. In 1999 he was awarded the academic degree of Doctor of Medicine. Marek Filipek, MD, PhD, is the Head of the Urology Unit at the Independent Specialist Zachodni Hospital in Grodzisk Mazowiecki. He created from the scratch one of the most modern and the best equipped urology units in Poland. For many years Dr Filipek had cooperated with the Urology Clinic, Collegium Medicum, Jagiellonian University, where he worked as a senior research assistant and lecturer. He participated in many research and refreshing courses. He did various internships and stayed at scholarships at numerous prestigious urology centres, including the Department of Urology headed by Professor F. Debruyne in Nijmegen. From 2000 to 2006 he was a head of the Urology Unit at the St. Lucas Voivodeship Hospital in Tarnów. 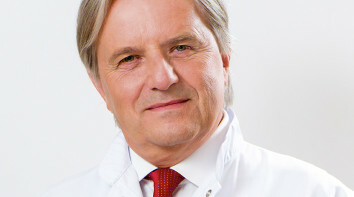 Marek Filipek, MD, PhD, is a promoter of innovative treatment methods and surgical techniques. He specialises in diagnostics and treatment of prostate disorders. Marek Filipek, MD, PhD, is a member of the Polish Urological Association (PTU) (in 1997 he was a Vice-Chairman of the PTU Krakow Branch). He is also a full member of the European Association of Urology. He also received numerous awards for his research activities and achievements in the area of urology (including the first prize of PTU and the Professor Zev Wajsman award). Scientific achievements of Marek Filipek, MD, PhD, encompass several dozen publications and papers presented at meetings and conferences in Poland and abroad. He is an author of over 30 publications and papers published in various journals, including Urologia Polska, or presented at conferences of the Polish Urological Association and the European Association of Urology. He also participated in numerous international multicentre clinical studies. Each year Dr Filipek also attends meetings of the American urological Association. Marek Filipek, MD, PhD, highly values cooperation and exchange of experience with medical centres abroad, specialising in modern methods for prostate cancer treatment. Since 2011, the medical team at the HIFU CLINIC Prostate Cancer Treatment Centre cooperates with Stefan Thüroff, MD, PhD, from Klinikum Harlaching in Munich, where the HIFU procedure has been used for treatment of prostate cancer for over 18 years. The most difficult medical cases are frequently discussed by specialists from HIFU CLINIC and the team from Munich. Since 2013, the specialists from the medical centre HIFU CLINIC Prostate Cancer Treatment Centre have been cooperating with Professor Mark Emberton and Dr Hashim Ahmed, concerning Sonablate 500 HIFU at the University College in London. They are specialists in the focal therapy of prostate cancer. In 2014, Dr Filipek underwent a training in Focal-One HIFU with Dr Albert Gelet, at Hospices Civils de Lyon Edouard Herriot Hospital, Lyon, France. In the same year, in April, the Doctor also participated in a training course "Focal therapy in prostate cancer” organised by the European School of Urology in Stockholm. Dr Filipek speaks fluent English.